Metric: Feasts. Creating an odd hybrid of previous metrics would create something Lovecraftian... so instead I'm going to use the most common typo I've done writing this review. Random yet apposite. DISCLAIMER: Review based on a PDF copy provided by Open Design. Overall: 5 feasts. Some tweaks on content and improved artwork, while you can still pick these up individually, the collection provides helpful structure and removes the rough edges in some of the previous books. Worth getting in it's own right as a companion volume to APG for those needing to lessen the learning curve. Contents: 5 feasts. 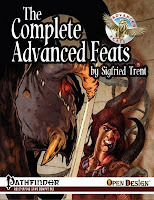 This compilation has all the feats in the Advanced Feat series in one place (with a seven page table summarising them) and a little tweaking which will make some GMs sigh with relief. These in combination will encourage players and GMs alike in exploring options. A fair share of these feats are not limited to the APG classes and provide options for those players who still want to play clerics and rogues. My only kvetch about this PDF is a minor one - hyperlink the feats in the table to the feat entries. Given the breadth of options and versatility that the feats offfer, there is enough to spark many interesting new characters for years to come. Following the feats are clear guides to each of the Pathfinder Advanced Players' Guide classes from alchemist to witch and builds with attached characters for each of these. Character sheets for a cavalier's mount and summoner's eidolon help those with special friends keep track of them. Dotted among all of these are pieces of commentary and sidebars that show the thinking behind certain feats and character decisions. These offer little tasters of design insight and playability considerations. Artwork/Layout: 5 feasts. The cover has a hero with his back to the wall - an excellent piece by Christophe Swal. Interior art from Christophe Swal and Darell Langley provide whimsy as well as action, the chihuahua on p22 is extremely funny. The increasing amounts of colour art reprising the covers of the previous books really help the Complete Advanced Feats stand out. The economy-size table of feats is easy to search and the layout is easy on the eye. More than just a list of feats? From this showing, definitely! Characters are attached to builds, the sheets for eidolon and mount have whimsy all of their own. Worth getting if you have the other PDFs? Again yes, the tweaks and organisation of Complete Advanced Feats make it easier to use and reference. Having banged on about a compilation for some time, now it's here, I'm glad to see some extra work went into it's assembly and that the layout is inspired by the best rather than going back a step. Sigfried and the team have provided a companion volume to Paizo's APG that compliments the new core classes admirably.